Late spring frost damages flowers and young leaves! One feature of climate change that's of interest to our lab is the increasing likelihood of frost damage to flowers and young leaves in the spring. Warm temperatures cause plants to flower and leaf-out earlier, and increasing variability in spring temperatures, including late-spring frost events, is leading to a greater likelihood that vulnerable flowers and young leaves will be damaged by frost. This spring, we have seen this phenomenon in action in the Boston area! Following a record-breaking warm winter and warm spring, plants at the Arnold Arboretum started leafing out and flowering at the end of February! 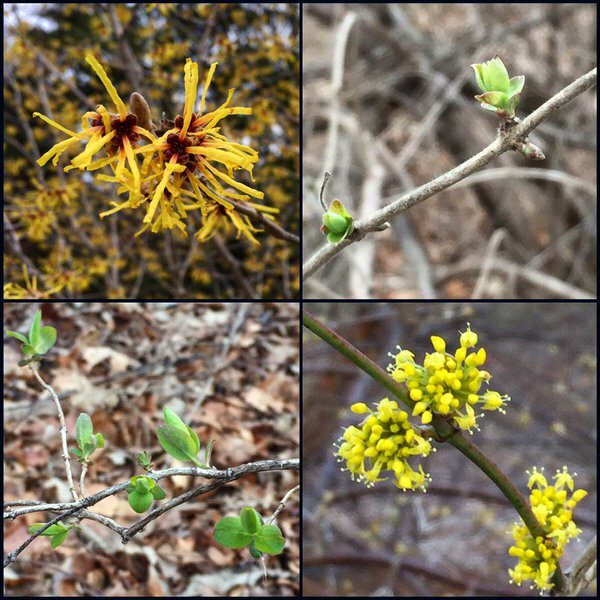 These photos of Hamamelis mollis (top left), Lonicera korolkowii (top right), Lonicera tatarica (bottom left), and Cornus officinalis (bottom right) were taken at the Arboretum on February 28, 2016. Sargent's cherry (Prunus sargentii) during peak flowering in 2015 (left) and 2016 (right). The inset photo shows heavy frost damage to flower buds and light frost damage to young leaves. 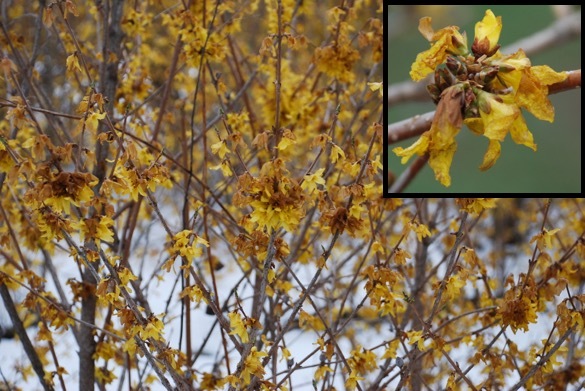 Other plants like Forsythia sp. had flowers that were also badly damaged by frost. For wild plants, frost damage to flowers can have dramatic consequences for reproduction. In addition to frost damage to flowers and flower buds, we observed that many young leaves were killed or damaged by the frost. We have recently conducted experiments on the frost tolerance of young leaves in the laboratory, so we were particularly interested in seeing the effects of a natural frost on leaves at the Arboretum. In some cases, such as many of the Berberis species, leaves showed almost no damage following the natural frost. In other species, leaves that looked heavily damaged in the days following frost events were able to mostly recover, such as in Prinsepia sinensis, while some species appear to have sustained permanent frost damage. It is unclear whether heavily damaged plants will re-flush new leaves or simply undergo limited photosynthesis during this growing season. If you are in the Boston area or your region also experienced a late spring frost, we encourage you to look for signs of frost damage to flowers and leaves! Data gathered by satellites are increasingly being used in studies of plant ecology, landscape ecology, and climate change biology. Researchers from the BU Biogeosciences Program are now using data from the Landsat satellite to determine the places where trees leaf out early and leaf out late at the scale of 30 m pixels. This unprecedented level of detail allows researchers to measure and predict how present and future climate change will affect the onset of leaf-out in our forests. Our research group is working with Eli Melaas to provide field observations of plants, in order to help verify the maps made using remote sensing data. In this map of the Allandale Woods in the Jamaica Plain area of Boston, the average leaf-out times are shown, with the red indicating early leaf-out and the light tan indicating later leaf-out. Areas shown in green are lawns, fields, and other areas not occupied by trees (these areas were excluded from the phenology maps). We will be monitoring leaf-out times once a week along a transect through the Allandale Woods that ranges from early leaf-out to late leaf-out, during the spring season. We will also monitor several other transects that span the range of early to late leaf-out, around the Boston area. 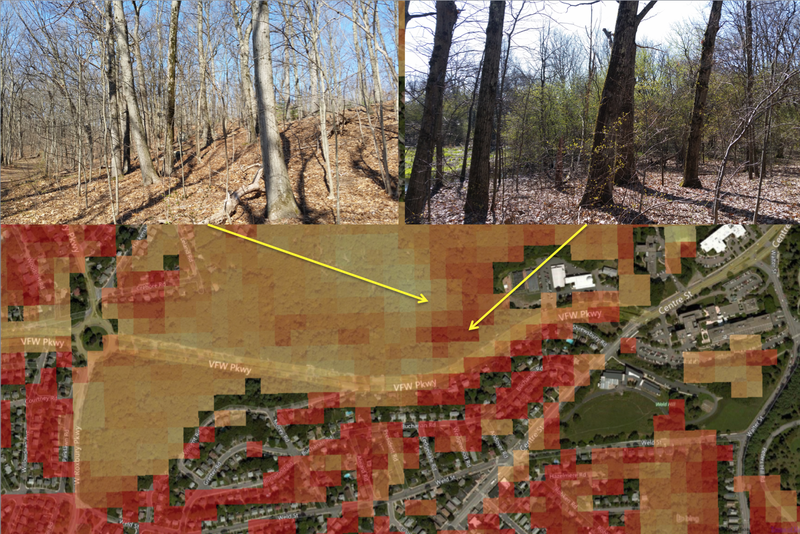 Will leaf-out times on the ground correspond to leaf-out times using remote sensing data? Are different leaf-out times due to microsite differences in temperature, different species of trees in each location, or different shrub understory? Stay tuned to find out! March was an important month for me in the Primack lab! With help from lab members, I conducted my first experiment as a graduate student: an investigation of the effect of air humidity on leaf-out times in native and invasive shrubs and trees. This study was motivated by a recent paper, Laube et al. 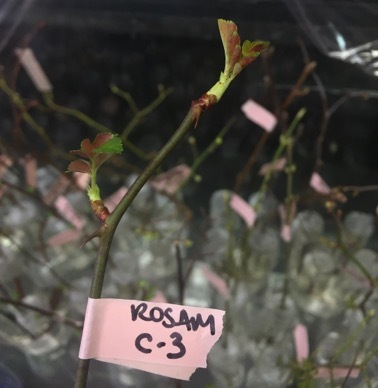 2014 (doi: 10.1111/nph.12680), showing that dormant twigs in a high humidity growth chamber leafed out about seven days earlier than dormant twigs in a lower humidity chamber. Could leaf-out in the spring be affected by humidity as well as temperature? We decided to test Laube’s hypothesis. 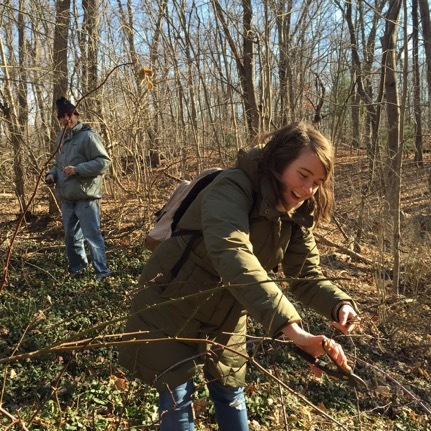 For our experiment, Richard Primack, Amanda Gallinat and I collected twigs from 15 species, including native and invasive shrubs and native trees from the Boston area. 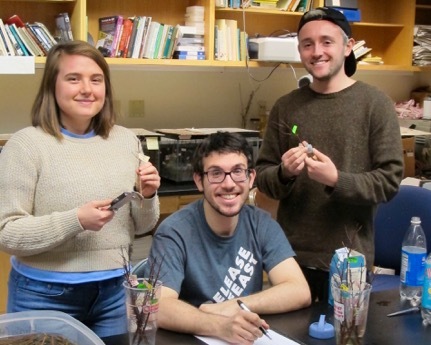 We brought the twigs back to BU, cut the stems, and placed them in cups of water, with help from BU undergraduates Luca Russo, Dillon Travis, Melissa Ruano, and Lucas Stegman! Twigs of every species were exposed to each of four humidity treatments: high, medium-high, medium-low, and low. In the course of this experiment we realized that our building is extremely dry – it has the humidity of the Sahara Desert! We monitored the twigs daily for leaf-out over the following four weeks. Do twigs leaf out earlier in humid environments? Stay tuned for the results.